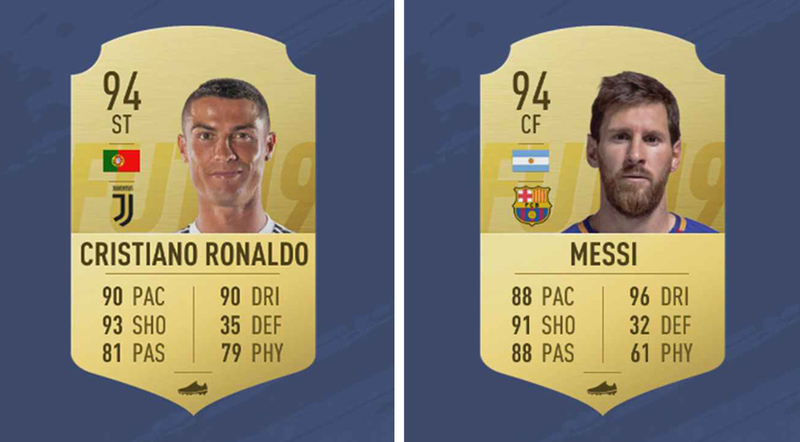 Lionel Messi and Cristiano Ronaldo share the top spot for FIFA 19’s best player after EA Sports just unveiled the pair’s ratings. The pair both landed 94 ratings to secure the top spots in EA’s Top 10 players on FIFA 19, meaning that they no doubt become the most-coveted cards out as FIFA players begin constructing their Ultimate Team squads. Other highlights in the Top 10 are David De Gea and Sergio Ramos, who become the highest rated keeper and defender respectively on the game with 91 ratings, two Belgians in Eden Hazard and Kevin De Bruyne securing 91 ratings for the first time, and Luka Modric, who also secures a 91 after his best season ever in a Real Madrid shirt. Toni Kroos (90), Luis Suarez (91) and Neymar (92) complete the Top 10 best players in the game, with the official FIFA 19 demo made available to players tomorrow. Also make sure you check out the full Top 100 list, the UK artists have made the cut for the FIFA 19 soundtrack, and all the best new additions to FIFA 19 in our breakdown of the game, here.